Knife grinds? What are the advantages of different grinds? What are my favorite knife grinds for bushcraft? In this article we are going to breakdown everything you need to know about knife grinds and what you should choose for your bushcraft blade. So you’ve heard just about every single so called survival expert in the world tell you the most important tool to have in a survival situation is a knife. But they don’t go into much depth about what grinds you need for the type of work you expect that knife to do. So here are the top ones you need to know and what they are meant to do! Cutting Ability- Heavily outweighs all other factors. If knife doesn’t cut well, then what is the point of carrying it. You can have the best steel and ergonomics in the world and it means nothing if it doesn’t cut well. Edge Retention- How long does the knife hold a sharp edge? This becomes very important when you plan to be in the field for longer periods and need you edge to hold up through tough tasks without resharpening. Overall Durability- Does the knife hold up to heavy use? All that really matters is whether you can slam this baby through a cinder block un-scathed or not. I kid, I kid. Though it does seem many in the industry consider extreme durability a much higher priority than they should. Just take care of the knife and use it for what it was intended and it’s not likely to break. But always buy the best your budget can afford. Because this is the most important outdoors tool you can carry. Ergonomics- How does it feel in your hand? If you have to use your knife a lot, then how it feels in your hand is pivotal. There are a lot of great knife makers out there, but very few of them understand how to build a professional grade handle. Sharpenability- How difficult is it to sharpen? Can you sharpen it in the field? With all the new super steels coming out that hold an edge forever, its hard to know what is the best choice. But it really boils down to a matter of preference and what you plan to do with the knife. Many people prefer a softer steel so they can sharpen it super quickly. Other prefer something they only have to sharpen a few times a year. I lean towards the super steels that are harder to sharpen, because I don’t like maintenance that much, and they tend to perform better. Scandinavian Grind style knives are hands down the king of bushcraft knife grinds because they are capable of doing numerous types cutting tasks efficiently. They are definitely my favorite knife grind and I think almost all outdoors instructors can agree for woodworking and campcraft, the scandi grind cannot be beaten for general use. This is also an exceptionally easy knife to sharpen and any beginner can get one sharp in no time. Think of the scandi grind as a double sided chisel and we all know chisels to be efficient at carving and removing wood in a controlled manner. The single most important performance factor for any bushcrafter to consider is how well the knife cuts through wood. If it can’t do that well, then sell it or chuck it in the bin for use with some other kind of job. Because cutting performance is the main priority. We need to quickly and efficiently remove wood for survival trap building, making friction fire kits, and other camp craft that is essential to our comfort and survival. For more info on TOP 10 SCANDI GRIND BLADES OF 2018, CLICK HERE! I truly believe that the saber and scandi grind blades go hand in hand. You should carry both because each grind has a preferred use. Though you’ll use your scandi grind 10 times more, you should have both. The saber grind is good because it offers superior durability and will hold up better than the Scandi grind will to more abuse. The Saber Knife Grind is essentially a really high scandi grind, with a secondary edge bevel at the edge to add durability. This grind is best for limb chopping, light batoning, and taking down small trees when a saw or axe isn’t handy. Pick a blade with some weight to it that can chop and handle heavy tasks. While this grind has better durability and edge retention, it will suffer when it comes to cutting wood efficiently. So it should be used as a backup and for heavier camp tasks. But we really think you should always have two different knives in your kit in case one is lost or broken. We also love a two sheath knife system when using kydex and for leather sheaths we like dangler options. 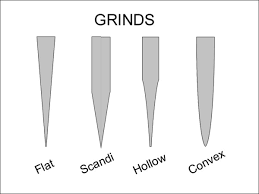 I really love a good flat grind, because it is somewhat of a mix between a saber and a scandi grind. The cutting performance is right on par with the scandi, and I tend to like a flat grind in a larger style knife, that I want to make cut as efficient as smaller blades. You can have a very thick spined blade and cut as well as a thin blade with a flat grind. Because the edge is so thin, it has similar performance but the downside of the flat grind is the durability. Even with a super steel, you can still roll the edge or damage the steel from heavy bushcraft use. It has a very thin edge and really should be used for lighter camp tasks. This isn’t my go to knife grind and is considered more of a hybrid option. So I really love convex style knives and they have a plethora of uses. Essentially a convex knife grind offers slightly lower durability of the edge than a saber grind, but cuts closer in performance to a scandi grind. Here is the kicker, a convex grind will work better at taking small amounts of material off or doing finer cuts. While the zero degree scandi will take large amounts of wood and be harder to control for tasks such as feather sticking. It is trying to play in both worlds while offering durability & controllability. The Bark River line of knives is done in convex and is a great choice for any woodsman. This knife grind is ALL about cutting ability and remember that the thinner the edge, the better it will cut. The hollow grind is one of the thinnest and weakest edges you can get but will get razor sharp. This type of grind is always used best for skinning, gutting, and butchering animals. I’m absolutely a believer that you should carry several knives in your outdoors kit. You should have a scandi for fine wood working, a saber for heavy camp tasks, and hollow grind for cleaning game. When it comes to longer term survival, you will spend more time cleaning game than almost anything else you will with a knife. So this knife grind is a must have in any bushcrafters kits if he plans to get his meat from the land. There are so many options when trying to pick a bushcraft blade or set of blades for outdoor use. The options can be mind numbing and overwhelming. So here is what I tell students about knives in general. Get the best you can afford! But if you can’t afford much, then get something with a great knife grind for the task. You can put a great grind on a terrible steel and it will still cut good for awhile. Put a bad grind on a fantastic steel and it will still cut bad despite being great steel. Grind geometry is far more important than steel choice, ergonomics, or anything else about the knife. It needs to cut well, and the grind & sharpness are the most important factors to consider. Each grind has something it’s designed to do so use the knife for it’s intended purposes. Carry several if there are several cutting tasks to be done. They weigh very little and you can rebuild almost anything with a good set of blades. So why not have them all? https://survivalschool.us/wp-content/uploads/2018/08/Best-Knife-Grinds-Featured-Image.jpg 640 960 webadmin https://survivalschool.us/wp-content/uploads/2018/05/inner_header_logo.png webadmin2018-08-23 17:56:132018-08-23 18:00:14TOP 5 Knife Grinds Every Bushcrafter Needs to Know! There is nothing worse than tangled paracord (cordage). If you have ever done any shelter building with cordage then you know what I am talking about. The Spool Tool is amazing because it holds up to 100 ft of paracord, and it has a cutting blade and spot to hold a mini Bic lighter. I absolutely love this thing. This nifty gadget is great for keeping your Bic lighter dry. I love kayaking, and in the winter time it is essential that you have good fire starters that will work even if they get wet. The FireSleeve is a waterproof case for your Bic lighter. It also has a rubber flap to slide over the gas button so it stays lit. I did have to remove the child safety to get the flap to stay. Overall great gadget for the price. I love survival bracelets, and they make excellent gift for kids and kids at heart. Unfortunately a lot of them are overpriced, or the bracelet doesn’t fit right. The great thing about the SpeedyJig is it is easy to use, and you can get the perfect fit every time. Once you get the basics down then you can begin adding things to make it the ultimate survival bracelet. I have one with some fishing line, hooks, jute twine, and even a small ferro rod attached to it. This amazing knife sharpener will get your blade extremely sharp. Even if you have no experience sharpening knives the guides help you get the perfect angle for bushcraft. I used to always struggle getting a consistent edge on my knives until I started using this handy gadget. You can also sharpen serrations and fish hooks. I love it’s versatility, and not only does it have diamond plates it also has a ceramic rod and leather strop on the sides. I won’t go into the field without it. These amazing lanterns are great for backpacking because of their portability and weight. They are extremely light, and they pack up nice and compact. The inflatable design turns the light from and ordinary lamp into a bright lantern. The best part is it is solar powered. I had the opportunity to use one of these first hand recently during a search and rescue training I was doing. It wasn’t no spotlight, but it lit up the area really well. I plan on taking two with me when I go to the Jungle in June. There are several gadgets out on the market right now, and there are sure to be hundreds more, but these 5 are winners in my book, and if you are looking at picking up any of these items be sure to support Sigma 3 and purchase from the links provided. https://survivalschool.us/wp-content/uploads/2018/02/survival_gidgat_work.jpg 604 1030 webadmin https://survivalschool.us/wp-content/uploads/2018/05/inner_header_logo.png webadmin2018-02-09 14:21:122018-08-18 15:08:29Survival Gadgets that Work! The conditions outside will dictate everything, and could encompass thousands of different temperatures and climates. For this article we will be highlighting some of the Best Cold Weather Sleeping bags. When it comes to wilderness outdoor activity there are really only 3 types of buschcrafters. The “Arm Chair Bushcrafter” – Enjoys the virtual arena of the outdoors, and finds enjoyment in the entertainment side of survival. 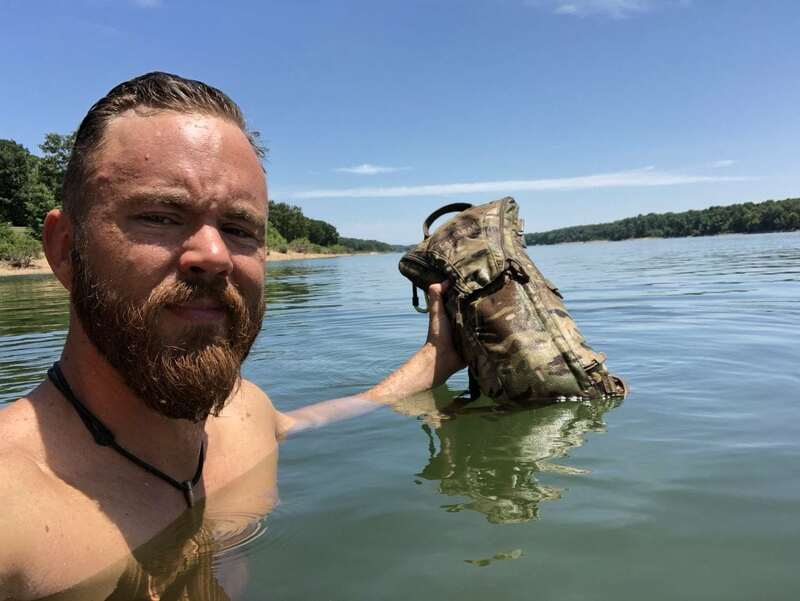 The “Avid Bushcrafter” – Enjoys physically getting outdoors, and actually training in survival skills. They enjoy the occasional overnighter, but many times their outdoor activity is dictated by the conditions (weather/climate/etc.). The “Active Bushcrafter” – Enjoys testing themselves, and finds joy in challenging conditions. They like to see how their gear functions in less than ideal circumstances, and will typically stay out multiple days, as their schedule permits. I have spent many nights sleeping on the cold ground with improper sleeping gear. 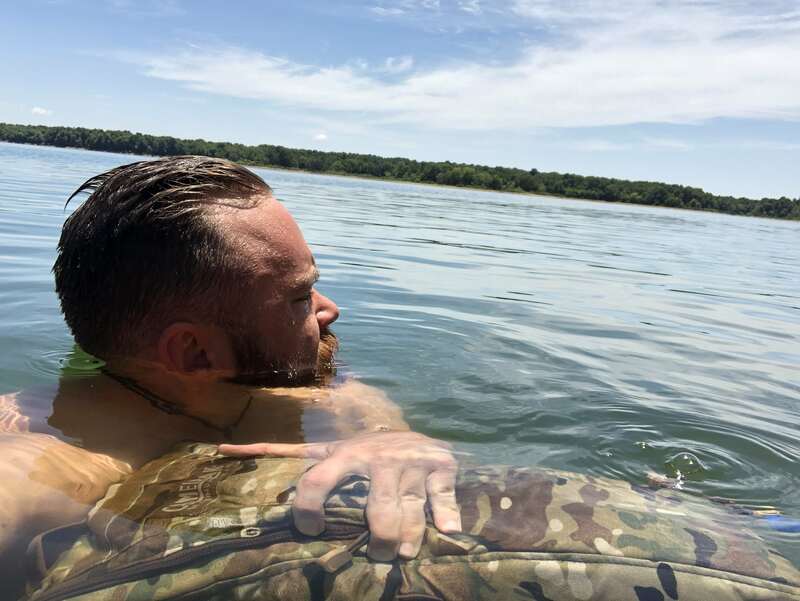 When I first got into survival I was convinced I only needed a wool blanket to make it through the night, and although I still love wool blankets, in harsh environments they simply are not enough. Even the natives would use large thick animal hides such as elk or buffalo. I have found after years of training that I still prefer a quality layering system. That is why the Military Sleep System has been so popular, but over the years technology has evolved. Many companies now are making quality high end sleeping bags that are light weight, compact, and affordable. With the right sleeping bag you can easily survive in sub-zero temperatures, and when you add a simple wool blanket or down throw you will be able to comfortably sleep in negative degree temperatures. U.S. G.I. Modular Military Sleeping Bag System (4-Piece) – I used this system for years and loved they layering capabilities, but it can be bulky. Snugpak Tactical Series 2 – I personally love Snugpak sleeping bags, they are extremely warm and versatile. Coleman North Rim Mummy Sleeping Bag – Affordable and reliable sleeping bag. Bulky, but really comfortable and warm. Big Agnes – 0 Sleeping Bag – Extremely comfortable sleeping bag filled with Thermolite Extra Simulated down and is for use in temperatures down to 0 degrees F.
The North Face Sleeping – One of my friends is a mountaineer and has summit some of the top glaciers, and he swears by North Face Sleeping Bags. Only downside is they are pricey. Multimat Foam Pad – Extremely durable closed cell foam mat. It is supplied to the British Army and is the most reliable sleeping solution. Thermarest Ridge Rest Solar Sleeping Pad – The aluminized surface is perfect for reflecting body heat adding to the effectiveness. Budget: “Buy Once, Cry Once” is our motto, and it is important that you get the best sleeping bag you can afford. Size: Be sure to purchase a sleeping bag slightly larger than you think you need. Temperature Rating: Be sure to do some research on what the bags insulate R value is. Make sure it is rated for the necessary temperature. Comfort: The size of the bag usually indicates the overall comfort. Large bags tend to have more padding, and provide more comfort. Shape: Sleeping bags come in all shapes and sizes. Mummy style bags are usually warmer, but are more restrictive to movement. Temperature Control: Think about where the zipper placements are, and preferably choose a sleeping bag with a head cover.